Spinal cord regeneration was once an impossible dream for doctors and patients. Once a spinal cord injury rendered a patient paralyzed, there was nothing that could be done to repair the damage. A groundbreaking new treatment, however, has given the medical community new hope. 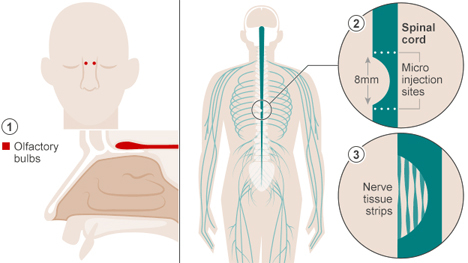 The lucky recipient of the world’s first application of this treatment was Darek Fidyka, a Polish man who was paralyzed after being stabbed in the back in 2010. Researchers from the UK and Poland worked together to test the idea that olfactory bulbs – small structures in your brain that control your sense of smell – could help to regenerate cells in the spinal cord. The team looked to cells from the olfactory bulb because olfactory nerves are the only part of the nervous system known to regenerate following an injury. The researchers removed one of Mr. Fidyka’s olfactory bulbs and grew cells from it – cells which were then injected at the injury site. Strips of nerve tissue from the patient’s ankle were placed on the gap in his spinal cord in the hopes that the injected cells would encourage regrowth. This method was tested successfully on dogs in 2012, but Mr. Fidyka was the first human patient. After intensive physical therapy and some healing time, he has regained some sensation in his lower body. 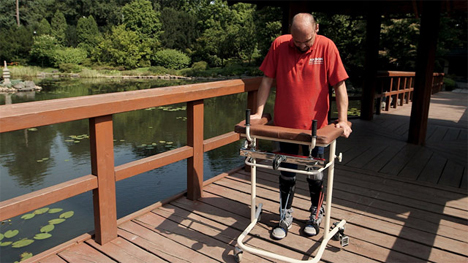 The most amazing result of the surgery, however, is that he is now able to walk with a walker just two years post-surgery. The research team is cautiously optimistic about the treatment, stating that they need to try the treatment in a larger number of patients with similar injuries before concluding that this is the answer for spinal cord repair. They also want to find a way to extract the needed cells in a less invasive manner than the brain surgery Mr. Fidyka had to undergo. In a stroke of luck, the patient has even retained his sense of smell even after having one olfactory bulb removed. The findings were published in the journal Cell Transplantation.